Year 2015 is the Year of Green Wood Goat and hence the Chinese astrology Goat or Sheep or Ram will have natural protection from heavenly planets and stars. The Goat 2015 Horoscope predicts that the mentally fragile Sheep will become energetic and enthusiastic during this year. Goat 2015 horoscope predictions suggest that Rams will become more courageous and optimistic. This will result in speedy execution of their ventures. They will be successful in love affairs and will find new partners. The personality of Goats will see a significant improvement as they are forced to deal with different types of people during the year. They will deal with challenging situations confidently. Contact with an entirely new set of people while executing their projects will have a positive influence on the Goats. Goats prefer to work in groups as they hate to be alone. They are gifted with unlimited energy and prefer to work in a peaceful environment. Goat 2015 Horoscope forecasts that whatever they want can be accomplished during the Year of the Sheep. They are sensitive people and can articulate their sentiments in fine arts. The social circle of Goats will enlarge immensely in course of doing their businesses. Their powerful and influential contacts will help in the monetary growth of Sheep in 2015. Excess money should not be splurged on luxurious personal items. Instead it should be invested wisely in profitable assets. No problems are anticipated for single people to get into new romantic alliances in 2015. With the newly found confidence, Goats may like to dictate their lovers which may result in a breakdown of the relationship. The Goats look for sincerity and commitment in relationships. Goat 2015 Horoscope warns that only such alliances have a chance of survival. Sheep will find romance and affection with their life partners in the year 2015. They will help them to run the family without any serious conflicts. In the family circle, the Goat 2015 Horoscope foretells that you will be affable with everyone and this will be reciprocated with a sense of admiration and love. You will get spiritual guidance from a senior family member. 2015 Chinese zodiac predictions for Goat suggest that 2015 is favorable for Rams to take up business tours and family holidays abroad. These will improve their business opportunities. Also their views on different nations and people will see a major change. 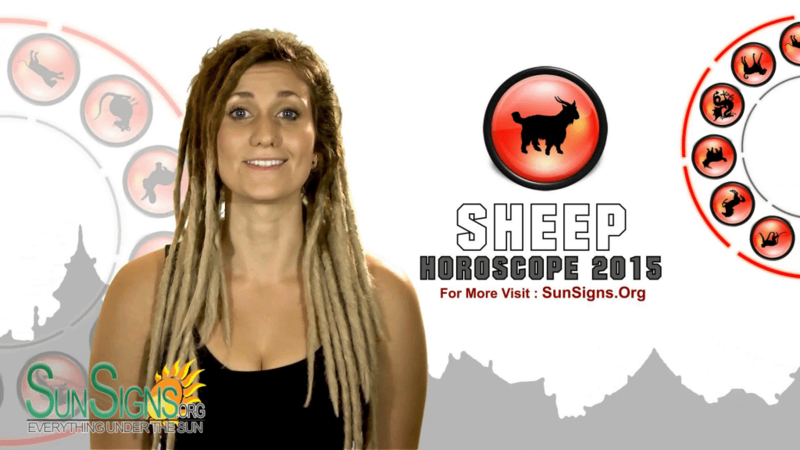 The Chinese horoscope 2015 shows that health will be encouraging for the Sheep sign and no major problems are forecast. They believe in enhancing their mental strength which will automatically improve their physical well-being. This will be an excellent year for the Goats. Make the most of it. Do not let your stubbornness spoil things for you.